I have found something unique in the community that surrounds us and continues to grow here at Let Them LOL. It’s hard (and maybe even a bad idea to try too hard) to put my finger on it, exactly, but I’ve gotten to experience something beautiful that grows in within the relationships that form here. Without trying to over-analyze it, I think there is perhaps a way to articulate what I have begun to notice and treasure about the heart of the people I know through this organization. It’s part of what attracted me here in the first place, though I didn’t even realize it happening at the beginning. I remember we rushed in at the last minute (not shocking) for technically the first LOL event we’d ever attended, in support of our friend. I sat with my then-boyfriend (now husband) surrounded by mostly strangers, sipping my coffee, fumbling with the tablecloth, respectfully prepared to listen, smile and nod, and then move on, returning to life as normal. 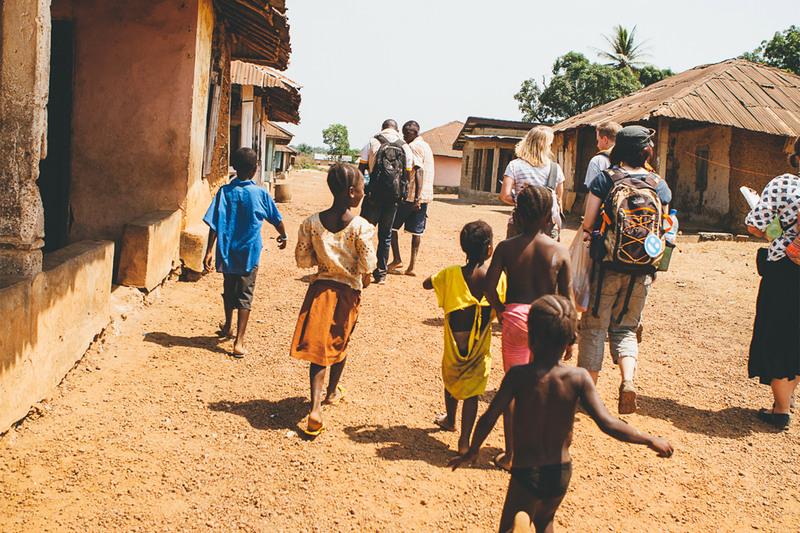 A few people who had recently attended a trip to Sierra Leone began to unpack bits of their experience for us and I remember beginning to listen closer as their stories caught my attention. How young ladies giggled, marveling at the luxury of soft, lotion on their hands before learning a sewing trade. How many children had never yet felt cold water until a well was drilled and this further added to their delight and joy when a pump was first installed. The lights dimmed as video footage began rolling of unfamiliar people in an unfamiliar country, but instead of the disconnection I’d previously felt through hundreds of commercials of impoverished kids staring blankly, as expected, what I started to feel – and see, and hear – was different. I saw great need, absolutely. But what I didn’t expect was the joy of kids – simply playing in water – looking and feeling so familiar… just like kids I’d babysat or neighbors of mine. The most vivid feelings became hot tears beginning to well up and stream down my cheeks at the sight of a Sierra Leonean man, Emmanuel, and his wife who nearly collapsed in such deep gratitude for simply being shown his new room painted in his favorite color. He erupted in thank you’s. I saw the way he stood in pride and strength to give himself fully to the role of ‘house father’ for a group of previously-orphaned children, and I saw his genuine overwhelming gratefulness expressed to people he didn’t even know on the other side of a camera lens for the opportunities he could see coming on behalf of his people. All of this gratitude – for clean water, for opportunity and a place to call home, for the color of paint. I was overcome. Though it was out of character, tears flowed well past the end of the video and the presentation, as strangers politely (awkwardly) inched away from that girl at the table! I didn’t care. I remember scrambling that night to buy LOL merch, in a desperate attempt to tangibly work out what I began internally wrestling with. Though I didn’t exactly know how, I knew from this point I would be getting involved with whoever cared about this, too. I had to find ways to do something, to give. Fast forward six years and now I can see something a little more clearly: the passion and invitation of a close friend, and the generosity of a man across an ocean inspired my husband and I to get involved. Their generosity drew us into this unique community that continues to shape our lives. 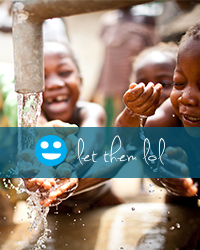 What I believe is this: (1) a common thread of desire to give and to lean in toward gratitude created the community called Let Them LOL and (2) it is like a kaleidoscope – both in Buffalo and Sierra Leone – and the metamorphic process is uniquely wonderful. Let me explain. A Kaleidoscope is dependent on light, being reflected over and over as it passes through various pieces of color to create an ever-changing combination of patterns or scenes. As Webster’s might say, with these pieces working together “a succession of changing phases or actions” or “a diverse collection” is formed. In its raw form, a Kaleidoscope is just an instrument, and in the dark it’s virtually useless. But with a wide range of pieces put together, all moving in succession and reflecting or allowing light to work through them, something new takes shape that is altogether more stunning than any one piece in isolation or darkness. The very word Kaleidoscope comes from two greek terms kalos, meaning “beautiful” and eidos meaning “shape,” plus an english element -scope or “something for viewing.” Our LOL kaleidoscope community takes the light of hope and giving, reflects this story in and with all our uniqueness, and as a result something truly beautiful takes shape, something worthy of being seen, like a City on A Hill. In six years of getting more involved with Let Them LOL I am drawn to the way this kaleidoscope community of giving and generosity continues to unfold. I have since visited Sierra Leone and been deeply inspired by how much we have to learn from a community there who deeply appreciates each other in the small moments of every day, who values family and relationship so highly, and has much to teach us as they reach out in gratitude for every small thing. I have met youth whose humble gratitude for clean water and education keep me motivated that no amount of my time, talent, and treasure is ever wasted when spent on their behalf throughout the year. I have developed life-changing and lasting friendships here in Buffalo with people whose stories of generosity and giving inspire and challenge me to love my neighbor better; people and children remind me constantly how giving is really about so much more than money and how every drop matters. This community, old and new, near and far, leaves me excited to continue to pour my heart into Let Them LOL in all the ways I can, with the same passion I felt on the night of first event and in the process I know I’m not alone in this. When we are together, our differences are beautiful because a common thread of hope, open-handedness, and thankfulness grows and binds us on a level that makes friends feel more like family. The result of our coming together creates momentum as we figure out how we fit together in all different ways. Even as our LOL community grows and changes, what I’m seeing so far (and what I’m praying and hoping continues to grow) isn’t fear but an increasing sense open arms and always room for more, because I think what we can all really see is the forming and morphing of light as it passes through a kind of kaleidoscope. In all it’s imperfection, it is still something sort of amazing. Which honestly is something I think a lot of us are reaching out for these days. So if you’re reading this and feeling any bit of uncertain? Please know something incredible is happening and there’s room (and a need) for your color here. You might be surprised at how it will inspire and form a heart of giving and gratitude in you as you learn from and lean into others, so be warned! Bottom line? We’re growing, shifting, and still re-shaping all the time, but there’s light to be found and you’re invited.